When founder Dave Loader first invited excited youngsters to take up an instrument ON 18 October 1973 and prepare to march their way into the history books, the very first lad through the door to do so was none other than Dan Doherty. Dan rose through the ranks to the eminent status of Staff Sgt. “My Staff Sgt” as I have always referred to him as. I recall many times when My Staff Sgt forced a number of us oiks to re spit and polish their shoes, or to clean our belt buckles better than they were presented at inspection. At the time, I didn’t understand why he was being so mean, but as I got older, I realised that My Staff Sgt’s reach and drive for perfection was actually having a really positive impact on how I myself approached things. Dave Loader instilled in all of us a sense of ensuring that if you are going to do or start some, make damn sure that you do it to the best of your ability, and so over the years I started to take My Staff Sgt’s criticisms of my presentations as a compliment, as he could see that I could do so much better than I had presented. A life lesson that to this very day influences me personally, and I am sure gets passed on subconsciously to those I myself interact with. My Staff Sgt had instilled in me what Dave had instilled in him, and in my own way I, and those around me are attempting to pass on to the next generation. That, I believe is the thread that ties and binds all eras of Thurrock Drum & Trumpet Corps and Thurrock Marching Brass. The next generation can and never will be what the original band ever were, but they can continue to breathe life into good solid values that mean so much to so many of us. 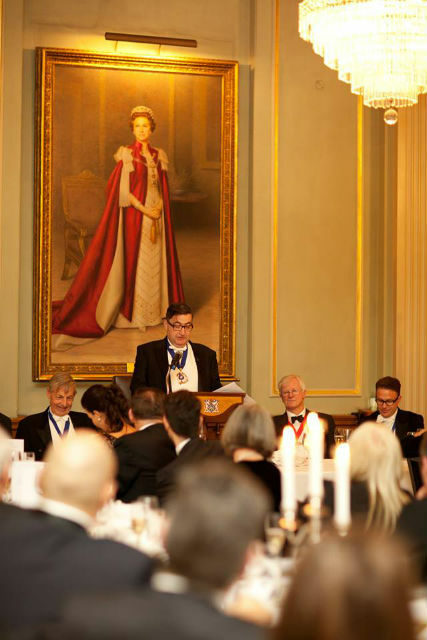 Dave Loader would have been incredibly proud of what My Staff Sgt has achieved throughout his life so far, and last night, in only a way that he could ever achieve, he incorporated the old values with the next generation yet again but including them in an incredibly moving and historic occasion which saw him installed as the Master of the Guild of Entrepreneurs, a Guild that he himself founded some 12 months ago. 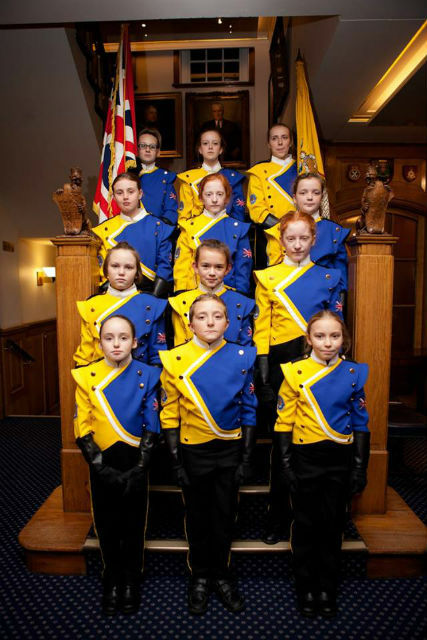 The Carpet Guard provided by the next generation of youngsters here at Thurrock Marching Brass lined spectacularly the stairwell where guests walked to their dinner reservations and with the Master using his persuasive prowess in the selection of his robe colours, one couldn’t help smile at the abundance of blue and gold everywhere. Thank you Dan for allowing the next generation of youngsters to experience such a wonderful evening, and congratulations from all of us at Thurrock Marching Brass for such a momentous achievement that I am sure our youngsters will look at as they travel their own life paths and say, Paul’s Staff Sgt made it….. so can I! Posted by News Editor on Tuesday, December 8th, 2015. Filed under Drum Corps U.K., FrontPage Feature.